So much worse than Auschwitz: "People not very different from us murdered other people not very different from us at close quarters"
Reprinted from "BLACK EARTH: THE HOLOCAUST AS HISTORY AND WARNING"
Auschwitz symbolizes the intention to murder all Jews under German control, and Jews from every corner of the German empire were murdered in its gas chambers. Some Jews survived Auschwitz because it remained, to the end, a set of camps as well as a death facility, where Jews were selected for labor as they entered. Thus a story of survival at Auschwitz can enter collective memory. Almost literally no Jew who stood at the edge of a death pit survived, and almost literally no Jew who entered Treblinka or Bełz ̇ec or Sobibór or Chełmno survived. The word “Auschwitz” has become a metonym for the Holocaust as a whole. Yet the vast majority of Jews had already been murdered, further east, by the time that Auschwitz became a major killing facility. Yet while Auschwitz has been remembered, most of the Holocaust has been largely forgotten. Auschwitz has been a relatively manageable symbol for Germany after the Second World War, significantly reducing the actual scale of the evil done. The conflation of Auschwitz with the Holocaust made plausible the grotesque claim that Germans did not know about the mass murder of the European Jews while it was taking place. It is possible that some Germans did not know exactly what happened at Auschwitz. It is not possible that many Germans did not know about the mass murder of Jews. The mass murder of Jews was known and discussed in Germany, at least among families and friends, long before Auschwitz became a death facility. In the East, where tens of thousands of Germans shot millions of Jews over hundreds of death pits over the course of three years, most people knew what was happening. Hundreds of thousands of Germans witnessed the killings, and millions of Germans on the eastern front knew about them. During the war, wives and even children visited the killing sites; and soldiers, policemen, and others wrote home to their families, sometimes with photographs, about the details. German homes were enriched, millions of times over, by plunder from the murdered Jews, sent by post or brought back by soldiers and policemen on leave. For similar reasons, Auschwitz was a convenient symbol in the postwar Soviet Union and today in post-communist Russia. If the Holocaust is reduced to Auschwitz, then it can easily be forgotten that the German mass killing of Jews began in places that the Soviet Union had just conquered. Everyone in the western Soviet Union knew about the mass murder of the Jews, for the same reason that the Germans did: In the East the method of mass murder required tens of thousands of participants and was witnessed by hundreds of thousands of people. The Germans left, but their death pits remained. If the Holocaust is identified only with Auschwitz, this experience, too, can be excluded from history and commemoration. Auschwitz was one of the few parts of the Holocaust to which Soviet citizens did not contribute. Soviet citizens were recruited by the Germans for the mass shootings of Jews, and Soviet citizens built and guarded the gassing facilities at Treblinka, Bełz ̇ec, and Sobibór. To be sure, all of this was possible because the Germans sought to destroy the Soviet state, and because the Soviet citizens in question were unmoored from prewar reality and in some cases trying to preserve their own lives. Yet after the war, Soviet propaganda was helpless to explain how so many people produced by the Soviet system had proven to be useful collaborators in the mass murder of so many other people produced by the Soviet system. It was enough of a problem, in the post-Stalin era that began with his death in 1953 and continues to this day, to explain why Soviet policy brought about the death of millions of Soviet citizens by famine and terror in the 1930s. This historical reality remains thoroughly politicized. The perhaps deeper problem, that tens of thousands of Soviet citizens could contribute to the murder of further millions of Soviet citizens on behalf of a totally alien system, has never been addressed. It has instead been displaced. Auschwitz has also become the standard shorthand of the Holocaust because, when treated in a certain mythical and reductive way, it seems to separate the mass murder of Jews from human choices and actions. Insofar as the Holocaust is limited to Auschwitz, it can be isolated from most of the nations it touched as well as from the landscapes it altered. The gates and walls of Auschwitz can seem to contain an evil that, in fact, extended from Paris to Smolensk. Auschwitz, a German word defining a bit of territory that before and after the war was in Poland, does not seem like an actual place. It is surrounded by mental as well as physical barbed wire. Auschwitz calls to mind mechanized killing, or ruthless bureaucracy, or the march of modernity, or even the endpoint of enlightenment. This makes the murder of children, women, and men seem like an inhuman process in which forces larger than the human were entirely responsible. When the mass murder of Jews is limited to an exceptional place and treated as the result of impersonal procedures, then we need not confront the fact that people not very different from us murdered other people not very different from us at close quarters. In the history of the Holocaust, Auschwitz was a place where the third technique of mass killing was developed, third in chronological order and also third in significance. The most important technique, because it came first, because it killed the most Jews, and because it demonstrated that a Final Solution by mass killing was possible, was shooting over pits. The next most important, and the next to be developed, was asphyxiation by the exhaust fumes of internal combustion engines. At around the time that these carbon monoxide facilities were coming into use, in early 1942, the policy of murdering all Jews was extended from the occupied Soviet Union and occupied Poland to all lands that fell under German control. Auschwitz became the major killing site for Jews in 1943 and 1944. Auschwitz arose as a concentration camp, the seventh large one in the Reich, after Dachau, Sachsenhausen, Buchenwald, Flossenbürg, Mauthausen, and Ravensbrück. Its notorious greeting, “Arbeit macht frei,” arose from these German precedents. This new camp, unlike these antecedents, was located in the lands of occupied Poland annexed by the Reich and thus within the zone where the Nazi imagination flourished. Its original purpose in 1940 was to prepare the way for the larger eastern empire to come. Its first prisoners were Poles who were punished for their real or anticipated resistance. Its next major victim group was Soviet prisoners of war taken after the invasion of 1941. Insofar as Jews were admitted to Auschwitz in these early years, it was with the intention of marching them east in columns as slave laborers who would exhaust themselves building the German empire on conquered Soviet lands. Jews who lived near Auschwitz were actually among the last Polish Jews to be killed. They were first deported to Auschwitz as forced laborers, because that was Auschwitz’s original mission. After the vast majority of Jews in the rest of Poland were already dead, murdered in pits or at Treblinka, Sobibór, Bełz ̇ec, or Chełmno, most Jews of the Auschwitz region were still alive. The purpose of Auschwitz changed as the Nazi colonial mission gave way to the Final Solution, as the subjugation of Slavs was deprioritized and the murder of Jews became urgent. This general shift was evident across a whole range of Nazi endeavors: the shift by the Einsatzgruppen from killing some Jews to killing all of them; the use of German policemen originally assigned to other missions for the mass shooting of Jews; the recruitment of local people for auxiliary police; the release of some Soviet prisoners of war so that they could aid in the killing of Jews; the transformation of the Lublin District from a forepost of empire to an experimental ground for gassing facilities. In the case of Auschwitz, the shift from the dream of conquest to the reality of annihilation meant that a camp became a killing facility. The killing agent itself reveals the evolution. Hydrocyanic acid, sold under the trade name Zyklon B, was originally used to fumigate the barracks of the Polish prisoners. Then it was used to murder Soviet prisoners of war. Finally it would be used to murder nearly a million Jews. Auschwitz was built in a zone of state destruction, after the invasion of Poland and as part of the attempt to obliterate the Polish political nation. Its original infrastructure was that of a Polish military barracks. As a territory it was conquered by Germany in September 1939 and granted to Germany by the terms of the German-Soviet Treaty on Borders and Friendship. Neither its construction nor its subsequent adaptations would have been thinkable, let alone possible, without the German campaign to eliminate rival polities and without the special talents and unusual goals of the state destroyers of the SS. Auschwitz was unusual, however, in one important respect. Unlike the death pits in the doubly occupied zone and the occupied Soviet Union, unlike the death facilities at Bełz ̇ec, Sobibór, Treblinka, and Chełmno, it was the planned murder site for very large numbers of Jews who were still citizens of states that Germany recognized as sovereign. Its intended Jewish victims were generally people who lived beyond the German zone of state destruction and who were therefore much less vulnerable to the imposing power of the SS. Such individuals had to be abandoned by their governments or stripped of their citizenship and physically transported from their country of residence to Auschwitz. There was nothing automatic about this, and indeed it often proved to be difficult. Hitler’s fantasy of a planet without Jews was always present, and his desire to rid Europe of Jews was known to his subordinates no later than the spring of 1942. As of that moment, the policy of the mass murder of Jews, initiated the previous year in the Soviet Union, was general. Yet whether and to what extent that policy could be realized depended upon where Jews happened to live. Because the successful killing strategies were a result of prior decisions and actions that were specific to a certain part of eastern Europe, they could not be repeated with the same kind of success elsewhere. What happened to states in 1939, 1940, and 1941, in other words, was crucial for what would happen to Jews in 1942, 1943, and 1944. The Germans could not exploit the psychological, material, and political resources created by Soviet occupation in places where there had been no Soviet occupation. The Germans could not reassemble the fragments of destroyed states in places where they or the Soviets had not destroyed the state. The Germans could not apply the politics of relative deprivation in places where the war was not a campaign of racial mastery. In the museum at Auschwitz built in communist Poland after the war, its victims were classified by citizenship. This was designed to obfuscate the basic fact that the great majority of them were Jews, and murdered for no other reason. The emphasis on citizenship also obfuscated a more subtle but central fact: that the Jews who were killed were first separated from their states. In many of the places from which the Jews were to be sent to Auschwitz, none of these conditions existed, and so Jews survived. Millions of European Jews who were condemned to die at Auschwitz survived because they never boarded a train. Jews under German control who were supposed to be sent to Auschwitz were more likely to survive than Jews under German control who were not supposed to be sent to Auschwitz. That is the Auschwitz paradox, and it can only be resolved by considering how states were and were not destroyed. These are the political particularities that explain the different outcomes within the universal design. Auschwitz demonstrates the universal design to kill Jews. It also demonstrates the general significance of statehood in protecting them. A comparison between two countries under German occupation can suggest the significance of the political factor. Estonia and Denmark had a great deal in common when the Second World War began. Each was a small northern European state with a long Baltic coast, and each was home to a very small number of Jews. During the war both were under German occupation, both were subject to the Final Solution, and both were declared judenfrei—free of Jews—by their German occupiers. And yet the history of the Holocaust in each land could hardly have been more different. In Estonia, about 99 percent of the Jews who were present when German forces arrived were killed. In Denmark, about 99 percent of Jews who had Danish citizenship survived. The Jews of Denmark were marked for Auschwitz; the Jews of Estonia met their fate before Auschwitz became a death facility. In no country under German occupation did a higher percentage of Jews die than in Estonia, and in none did a higher proportion survive than in Denmark. Given the totality of the German policy of killing Jews, this difference calls for an explanation. Surely the population of Estonia was known for its antisemitism? If anything, such a tradition is easier to document in Denmark. Surely the Estonians were governed by antisemites before the war? The double dictatorship of Konstantin Päts and Johan Laidoner was clearly conservative, but it came to power in a coup against the Far Right in 1934. In fact, Estonian Jews were equal citizens of the republic, which took in some Jewish refugees from Austria and Germany. Denmark, by contrast, turned away Jewish refugees after 1935. Intuitions fail. The extremely different outcomes seem to have little to do with popular attitudes and prewar politics, and much to do with different experiences of war and occupation. Auschwitz reminds us of Hitler’s vision of a world without Jews; it should also teach us of the importance of politics in hastening or hindering the realization of that vision. 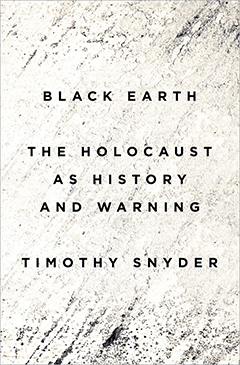 Reprinted from "BLACK EARTH: THE HOLOCAUST AS HISTORY AND WARNING." Copyright © 2015 by Timothy Snyder. Published by Tim Duggan Books, an imprint of Penguin Random House LLC. All rights reserved.